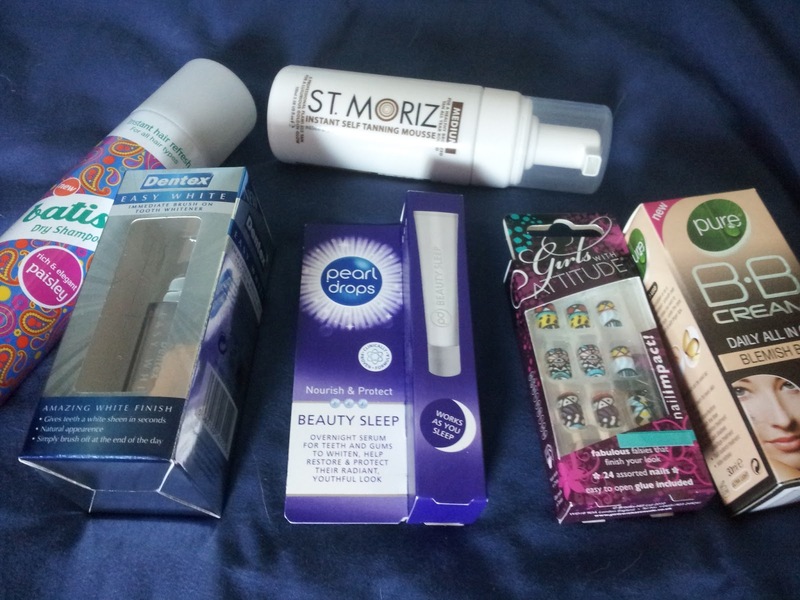 I managed to keep to just 4 products in Savers and 2 in Superdrugs. I will write down a quick overview of the two products from this haul I have used so far. St Moriz Instant Tan Mousse - I have to brag about this straight away. I was a self confessed Rimmel Instant Tan user, but since purchasing St Moriz, I have changed my opinion. Even though I got this in medium, it gives me a natural looking tan. You can notice the difference as soon as it's applied. So far no streaks, I've only used this a few times but even in the rain (day I tested it out, the English weather decided to be typical and pour down) it stayed on. Pure BB Cream (Ultra light) - This is my second BB cream I've tried, I've used the Nivea BB cream but this was only a couple of samples. In Savers Nivea BB Cream is £3.99, I was tempted but didn't want to buy it and hate it. Especially as I have super light skin. I came across Pure BB Cream in ultra light for £1.99, I was happy to give that a go. I have to say, I'm very glad I did. It's very good coverage, and the perfect colour for my skin. It glides on without any effort from me, and it's not to heavy on my face. On a lazy day, I have just used this all over my face. I do recommend this if it's your first time using a BB cream as it's super cheap, so if you feel it's not working for your skin, you haven't lost too much money. I am curious on other BB creams out there, id love to hear what you have used and which one works best for you? I LOVE batiste dry shampoo, it is by far one of the best hair care products ever! Ooooo I am interested to know if the whitening gels work? This is my new favorite. It beats the Rimmel one. Plus it's a whole lot cheaper! Definitely wanting to try the dry shampoo! Great Spring overhaul! I do recommend it. It's so handy, especially when you're in a rush. Will definitely be trying out that BB Cream, it's so cheap! I use the Rimmel London BB Cream which I really like, it brightens up your skin and adds a glow, but it's £6.99 and the tubes are quite small! You need to dilute one part of cranberry juice in a juicer. As you sweat, your body is doing to heal, to be healthy and strong. further get my ex girl backifying the body also improve.